Vineyard style gummed labels for adding the finishing touches to your bottles. Gummed labels for adding the finishing touches to your bottles. Packed in 25's, you simply moisten the label and place it in the desired location on your bottle. (Some people find it easier to moisten the bottle rather than the label). 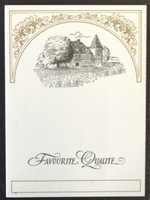 These are white coloured, vertical labels featuring a vineyard.